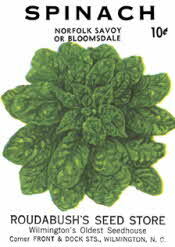 According to the USDA, 40,100 acres of Spinach were harvested for the fresh market in 2009. An additional 10,100 acres were harvested for processing: 9,700 acres for freezing and 400 acres for canning. 19th century cookbooks called for boiling spinach for 25 minutes! In 1929 Popeye the spinach loving sailor first appeared in the comic strip 'Thimble Theatre.' Elzie Segar created Popeye. In 1937 Spinach growers in the U.S. erected a statue in honor of Popeye the comic strip sailor. Spinach was the first frozen vegetable to be sold.